NINR and the Safe to Sleep® campaign, led by the Eunice Kennedy Shriver National Institute of Child Health and Human Development with other collaborators, recently partnered to update a continuing education (CE) activity for nurses, Risk Reduction for Sudden Infant Death Syndrome (SIDS) and Other Sleep-Related Causes of Infant Death. The activity informs pediatric, obstetric, and neonatal nurses; nurse practitioners; nurse specialists and nurse-midwives about the latest research and risk-reduction strategies for SIDS and other sleep-related causes of infant death. The activity can help refresh knowledge for nurses who educate family members and caregivers about caring for infants. It explains ways nurses can communicate risk-reduction messages to parents and caregivers without adding to their already busy schedules. 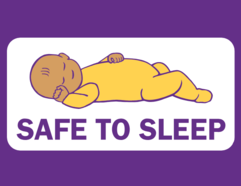 The activity describes modeling safe infant sleep practices immediately after delivery and encourages parents and caregivers to continue these practices at home. The CE activity is accredited by the Maryland Nurses Association, an accredited approver of continuing education by the American Nurses Credentialing Center’s Commission on Accreditation. To view or modify your subscription preferences or unsubscribe entirely, please visit the Subscriber Preferences Page. Unfortunately, we only have them in English right now. We are working with volunteers to summarize this information into a pamphlet–in English and Spanish. Just wanted to let you know that at long last, the Community Guide to the Master Plan Amendments is officially in print! Thanks to all who helped put this together; it was a massive undertaking, and it took many hands to bring it to fruition. If you would like hard copies, please email me back and we will figure out how to connect; the link to the pdf file online is http://www.cbno.org/site/wp-content/uploads/Master-Plan-2016-Amendments-Synopsis.pdf Thanks also to Baptist Community Ministries, Foundation For Louisiana, the Greater New Orleans Foundation, and the Mid-City Neighborhood Organization, all of whom contributed to the costs of producing the Guide. Also, please share this information among your colleagues, contacts, communities and constituencies, and let them know that hard copies are available from CBNO. It is simply imperative that as many people as possible participate in the Master Plan amendment process. The Master Plan is the road map for the future of our city, our neighborhoods and our lives, and it must remain a document of the people, by the people, for the people. CBNO works to create equity and opportunity for all New Orleanians by developing community leaders, fostering civic engagement, and advocating for open, effective, accountable government. Celebrating 50 years of building community in 2016! Community Matters! Decades of scientific research have shown that being part of a supportive, inclusive and capable community promotes mental, physical, and social well-being more than any other factors known to the social and medical sciences. Community Science is a group practice of social change professionals who use knowledge to build healthy, just, and equitable communities.